Syracuse lacrosse midfielder Brendan Bomberry goes on attack in the second quarter of the Orange's game against Johns Hopkins. Mandatory Photo Credit: Initra Marilyn, The Juice Online. 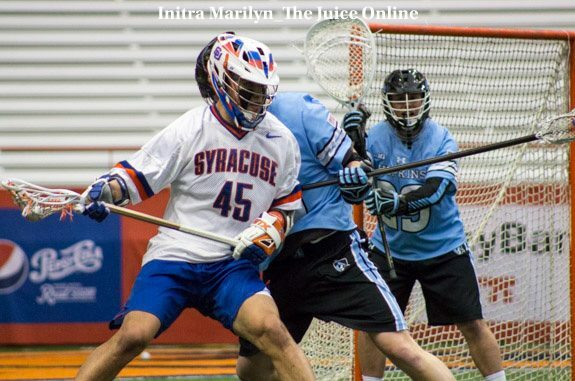 Some are calling it a rebuilding year for Syracuse lacrosse. The Orange fell hard at home again against Johns Hopkins in a miserable 18-7 loss. Nate Solomon sat out with a suspension and Brendan Bomberry left the game with an injury. With Solomon and Bomberry missing, only underclassmen scored for Syracuse. Sophomore Jamie Trimboli recorded his first career hat trick, redshirt freshman David Lipka added two goals of his own, and freshman Brendan Curry and redshirt sophomore Stephen Rehfuss each scored one. This comes just one week after true freshman Tucker Dordevic scored four goals against Virginia to push the Orange to a victory. That was just on the offensive end. Redshirt freshman Brett Kennedy has stepped in for the injured Tyson Bomberry and prevented a major dropoff. He even added two goals of his own in the Virginia game. This Syracuse team lacks experience. The only upperclassmen starters in the Hopkins game were Dom Madonna, Brendan Bomberry, Marcus Cunningham and Brad Voigt. Voigt filled in for Solomon, another upperclassman as he served his suspension. The youth has proven to be the most successful this point. This senior class is weaker compared to a year ago. Brendan Bomberry and Madonna remain the only two in this five-man class that makes consistent contributions on a week-to-week basis. Seth DeLilse is a backup faceoff man who has won a woeful 31 percent of his matchups at the X.
Ryan Simmons has just three points in five games. Matt Lane still has not found his place on this team. It seems from the outside that this team is in need of some senior leadership. This group doesn’t really have a ton of that. Last year’s group had a core to rely on when times got tough. Syracuse does not have that core this year. However, the Orange has an opportunity to create one. Forging a strong young core to build this team around sets the team up for success in the future. That does not mean abandoning the rest of the season either. Turning the team over to the younger players now could set it up for success come the postseason. Putting the pressure on the underclassmen to fill important roles provides the experience necessary to win in the future. Something needs to budge for Syracuse though, because the current method is causing it to lose on its home turf against the top teams in the country. The schedule does not get any easier, but embracing the youth movement is the best thing for Syracuse lacrosse, both this year and beyond. Why did Syracuse make the NCAA Tournament? Its resume.